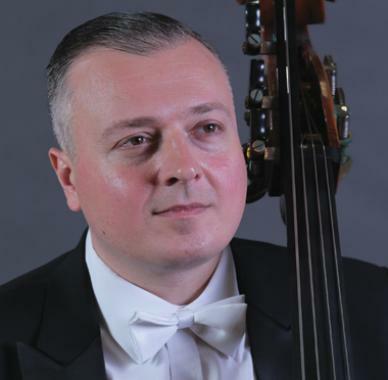 George Lomdaridze has been Principal Bass of the Hong Kong Philharmonic Orchestra since May 2011. George joined the HK Phil in 1999 and after 2 years in the US where he played regularly with the Chicago Symphony and the Louisiana Philharmonic in New Orleans, he returned to the HK Phil in 2002. Born in Tbilisi, Georgia to a family of classical musicians, George began his musical training studying piano and later double bass. He also studied trumpet and eventually composition, following in the footsteps of his father, the composer Elizbar Lomdaridze. George won the National String competition for Young Artists in Tbilisi at the age of 14. At 16, George was appointed by Maestro Jansug Kahidze to be the Assistant Principal Bass of the Tbilisi Opera and Ballet Orchestra. After his studies of bass and composition at the Tbilisi Conservatory, George went on to study bass with Professor Lev Rakov at the Moscow Conservatory. While in Moscow, he played as a member of the Moscow Radio and TV Symphony Orchestra. In 1995 George won the third prize in the first Sergey Koussevitsky International Double Bass Competition in Moscow. Upon graduation from Moscow, George was invited by London Symphony Orchestra Principal Bass Thomas Martin to study on full scholarship at the Guildhall School of Music in London. From London, George moved to Chicago where he studied with Stephen Lester of the Chicago Symphony. George performed under many of the world’s renowned conductors as principal bass of the Chicago Civic Orchestra and a regular substitute with the Chicago Symphony. George has played with the Pharos Soloists led by Levon Chilingirian in Cyprus, London and Prague. When not playing bass George enjoys exploring Hong Kong with his wife Damara, violist, and their son Tommy and daughter Natia. He plays a contemporary Bass made in 1997 by Albert Jakstadt.